To start cutting 2 eyelids from ultra suede using a template provided in the template. To make a template: (If you want to add eyelids to an existing bear), usually measure with the eye you will cover from side to side (this is the diameter of the eye). Then make a template out of cardboard that looks like a semicircle. The straight edge should be twice the diameter of the eye, and the height should be the diameter of the eye. (Ie if the eye measures 10mm, make a template 20mm x 10mm). Place a thin layer of glue on the straight edge of the eyelid Fold the edges and glue it Do the same with the other eye. Postponed I use self-adhesive eyelashes that are larger than the eyes on the bear (sometimes twice as long as I can get 2 sets of 1). 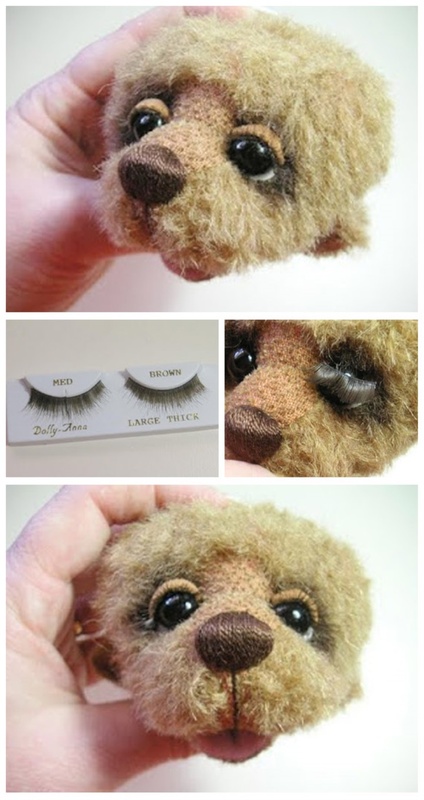 Cut one eyelash in half (or the length, the diameter of your bear's eye). Using a pair of thin point tweezers, clean one of them and place it in the small half-way angle of the bear's eye. Using tweezers, press the eyelashes into place, making sure they are well and truly stuck from side to side (if you find the glue is a little dry, but using a small amount of glue is clear to help it stick to the eyes).